The Kansas City Chiefs proved fans, analysts and oddsmakers all wrong with their resounding win over the defending Super Bowl Champions, the New England Patriots. All of the lines offered at legal USA online sportsbooks showed the Patriots as the likely team to pull off a victory. Even with WR Julian Edelman missing with a torn ACL, most had the Patriots as favorites to win over the Chiefs. However, coach Andy Reid executed a strong fourth quarter comeback to stun New England. At the beginning of the game, it appeared that the Patriots were going to pick right back up where they left off. QB Tom Brady led a 9-play, 73-yd touchdown drive to start things off. The Patriots were gifted with a fumble from Chiefs’ rookie RB Kareem Hunt, though that possession resulted in a turnover on downs. The Chiefs scored on their second drive to tie things up. 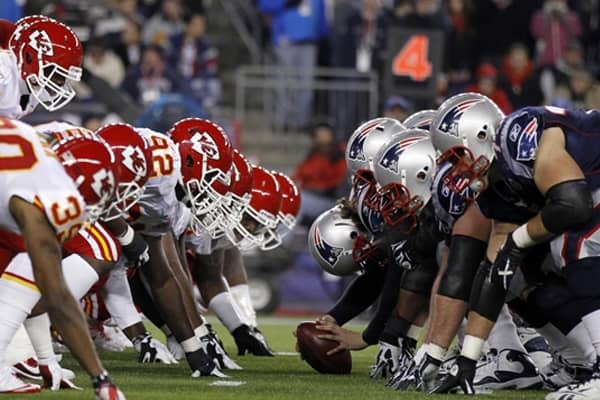 As the game progressed, a trend of the Chiefs catching up to the Patriots emerged. The fourth quarter began with the Patriots leading 27-21. All signs pointed to the game being a shootout, but Patriots fans were surprised with a more one-sided game. The Chiefs went on a 21-0 run to shut out the defending champions. Chiefs’ RB Spencer Ware went down with injury before the game, tipping the rookie for the starting position. Charcandrick West is on the depth chart, but there was no need for him, as Hunt rushed for 148 yards, had 98 receiving yards and 3 touchdowns—strong numbers for a debut outing. QB Alex Smith added to the Chiefs dominance with 368 passing yards and 4 touchdowns. This game taught us that the Patriots, who are favorites to reach the Super Bowl again, are vulnerable. They gave up 21 unanswered points in the fourth quarter at home, the night of their Super Bowl LI banner raising. It also taught us that the Chiefs mean business this year. Their 3-man rush affected Tom Brady down the stretch and limited his effectiveness with deep passes. At 40 years old, Brady still looks like he has enough to keep the team in contention. Tyreek Hill was a threat for the Chiefs last year on special teams. He put up some incredible returns on punts and kicks. Amidst their initial RB problems, the Chiefs tried playing Hill in the position, but he was limited. Once they moved him to WR, he began to light up the Patriots defense. He finished with 133 receiving yards on 7 receptions, including a 75-yd touchdown. One interesting component out of the Chiefs game plan was trick plays. At one point, they ran a read-option with TE Travis Kelce at quarterback. He ended up rushing for a first down after faking a pitch. It’s plays like this that can confuse defenses and lead to an offensive spark, which was exactly the case in Foxborough. Coach Bill Belichick will not take this loss lightly, so you can expect the Patriots to make adjustments. However, other teams may try and take a page out of the Chiefs’ book to keep them at bay. The Patriots are still a reliable betting option, and now the Chiefs have emerged as another strong betting contender. With the Patriots having been the favored team to win the game, there were likely a lot of bettors who were not too pleased with the upset or with the oddsmakers at sportsbooks offering legal football betting lines. This initial upset will certainly impact various components of how the 2017 NFL regular season plays out.